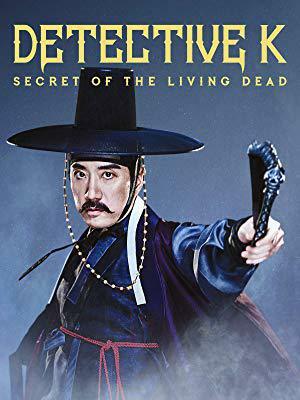 The adventures of Detective Kim and his friends come back on the big screen after 3 years, with a third opus: “Detective K: Secret of the Living Dead”. The feature belongs to the “Detective K” franchise, a film series based on Kim Tak-Hwan’s books and follow the story of Kim Min and his sidekick, Seo-Pil, during the Joseon era. Besides producer Kim Jho Kwang-Soo, the third film gathers the dream team again : Kim Seok-Yoon directing, Kim Myung-Min playing the overconfident detective and Oh Dal-Su playing his comrade in arms. Key ingredients are still there: humour, great chemistry between the two main characters, strong female character, action and fighting scenes. As hinted at the end of the second “Detective K”, the investigation focuses this time on mysterious and paranormal deaths. In Ganghwa Island, bodies with holes in the neck, burnt and shot with arrows are found. At the same time, a beautiful woman (played by Kim Ji-Won, famous for her role in hit-drama “Descendant of the Sun” and more recently in “Fight for my Way”) is brought back to life. She has no idea who she is. The Fantastic Duo runs into her as she is trying to figure out her identity. They pair up to solve the case. If the “Detective K” features can be compared to the “Indiana Jones” franchise for their light-hearted tone, action scenes, historical background and humor (plus the bromance), the third movie does not totally live up to the third part of its American counterpart. However, that is setting up the bar really high as third movies are always risky and not often a success. “Secret of the Living Dead” is an entertaining and funny movie, and passes the test of a well-done sequel without a doubt. Gags, absurdity and parody are present and make the movie really funny. The visuality of many jokes, the bright colors, as well as the fast pace and the many ingenuous transition shots, give the film a comic book aspect, which enhances the comedic aspect. The action set in Joseon allows to talk about social issues (class distinction) and is used to create comedy, though contrasts. Another worth-mentioning engaging side of the era is the costumes and settings. They are not the main attraction of the film, and would probably grind some historian’s gears, but are nice elements that add up to the reasons to watch “Secret of the Living Dead”. The two main characters are played by veteran actors, and it shows on screen. Kim Seok-Yoon and Oh Dal-Su’s chemistry is amazing. Rookie to “Detective K”, Kim Ji-Won, integrated quickly the codes of the historical-action-comedy movie and delivers an adequate performance. With “Secret of the Living Dead”, the audience is happy to find the Dynamic Duo back for new adventures. Although it can be watched independently from the two others, the film is in line with the others “Detective K”; it is a funny and entertaining feature.